So the Tinkerman has now been in charge of the Whites for 3 games, and we are starting to see signs of the team he is trying to create. Building on a base of a strong pair of banks of four, a new fast & direct attack is already starting to generate tentative improvement in results. 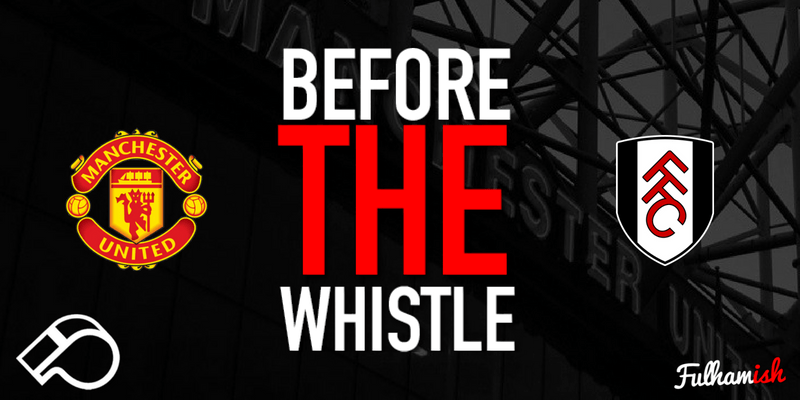 Can we continue to build positive momentum against a stuttering Manchester United side? Who could forget Bent’s last minute equaliser at Old Trafford in 2014? Across the season United have tended to set up in a 4-3-3 formation, but in recent matches they have been reverting to 3 at the back formation. They deployed this tactic at home to Southampton, in a surprisingly defensive set up, and also in their 2-2 draw earlier in the week at home to Arsenal. However, especially as we tend to play with a lone striker, I’d expect Jose will sacrifice a centre back and move back to a 4-3-3. Jose has rotated a fair bit with who he chooses from his squad, both to balance squad fatigue and to (seemingly) rebel against his owners due to lack of transfer funds, so it’s going to be hard to guess exactly who he will put out! Manchester United’s 4-3-3 (ish) average positioning vs Crystal Palace – will they attempt something similar? You’d expect a Mourinho team to be strong at the back, and emphasise tactical play to nullify the opposition. However this just hasn’t been the case this year, with the side conceding 25 in 15 games (when did we last see United have negative goal difference?!). It’s hardly like they are sacrificing shipping in goals to drive attacking play; this season they have really struggled in terms of chance creation. They rank mid-table for shots per game, dribbles per game, and chances created – a large drop considering this is a team who finished second last year! All the underlying numbers (check out the xG chart below) suggest that something is deeply going wrong in the red half of Manchester right now, and is not likely to get any better any time soon. To me, this is all likely the result of a lack of footballing direction at a top level and too much short term thinking in the transfer market. Compare them to Liverpool, who have a very clear long term strategy – which squad would you rather have right now?? When they do attack, they are most potent from wide areas of the pitch. In particular, their fullbacks (likely to be Shaw and Young) contribute well in attack, and expect to combine with their wingers and feed crosses into the big man Lukaku up front. Depending on which wingers United field (Sanchez & Mata cut inside, or Martial & Lingard will hug the touchline), the fullbacks will move into the vacated spaces to help with chance generation. He’s been a divisive figure since his £90m move from Juventus in 2016, however World Cup winner Paul Pogba is probably the standout man in this United squad. Despite struggling to live up to his hefty price tag, the Frenchman still brings a lot of quality to United’s midfield. No-one in the United squad this season has made more passes than him, or created more chances than him. He’s the key to United’s direct style of football – with his forward passes and high dribbling stats help drag the Devils forward up the pitch. Perhaps a weaker side to his game though is his determination to score thunderbolts every game. A success rate in 1 goal in 35 shots (see below) is appalling, and perhaps encouraging him to shoot from deep will be a useful tactic to frustrate the Frenchman. Pogba’s shot map – perhaps too confident for his own good! Jose has always been the kind of manager to tweak his lineup to try and outplay the opposition. Against bigger teams this often works well, as United will sit back and then counter. However, against weaker teams who may play the same way themselves, United struggle to break them down (see draws vs Wolves, Palace and Southampton). Therefore, it makes sense for us to drop back, let United play, and try and hit them on the counter (something we now have a bit of practice at!). On top of this, if we can also purposely encourage United to shoot from outside the box, with low percentage shots, this could be a great way to frustrate the crowd. When breaking on the counter, breaking fast and wide will be the best option. United’s fullbacks will try to push up in the game, offering pockets of space behind them which we can exploit. If we’re able to do this effectively throughout the game, and cause United pain on the break, Shaw and Young will be less likely to bomb forward in attack – removing one of United’s key focal points in attack. If we’re careful in defence, and clinical in attack, there’s no reason we can’t get the points required to finally heave ourselves off the bottom of the table – a great platform to build upon in our busy winter schedule.